Emerging tax legislation and regulatory changes have proven a challenge to tax departments over the past couple years. How can your tax department come out on top? 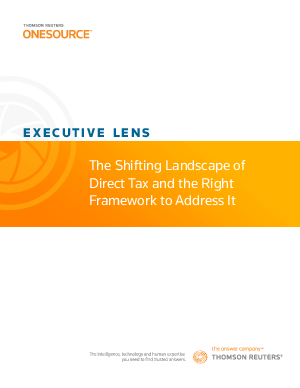 Explore what’s driving the game-changing shifts within direct tax and how a tax technology strategy enables exceptional tax management, propelling both your department and organization forward. Download the free white paper today. Thomson Reuters® ONESOURCE™, the industry’s most powerful corporate tax technology platform, drives global tax compliance and accounting decision making around the world. ONESOURCE is there for every step of your tax journey, helping to serve the complete needs of each stakeholder in your tax department.